SkyGolf GPS SG2...The Next Generation Rangefinder! Using a powerful microprocessor, GPS, and satellite-based accuracy enhancement technology, the SG2 automatically calculates, as you move, distances to up to forty targets per hole simultaneously in less than a second. You will already have your number when you get to your ball. The SG2's screens are designed to promote simplicity and ease of use. About the size of a cell phone, you can clip the SG2 to your belt and take it anywhere. No aiming, no missing. You don't need a clear line of sight or reflective target with the SG2. Because the targets are pre-programmed, the SG2 eliminates the need to aim through a lens, accidentally hitting the wrong target on a hole, or trying to hit a pin with a laser beam at 200 yards. 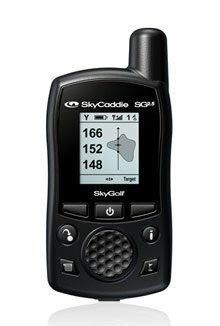 If you have any questions about this product by SkyGolf GPS, contact us by completing and submitting the form below. If you are looking for a specif part number, please include it with your message. POSMA GT1Plus Golf Trainer GPS Golf Watch Range Finder, Preloaded Europe, America, Asia Golf Courses no subscription, Black, courses incl. US, Canada, Europe, Asia, Australia, New Zealand etc.